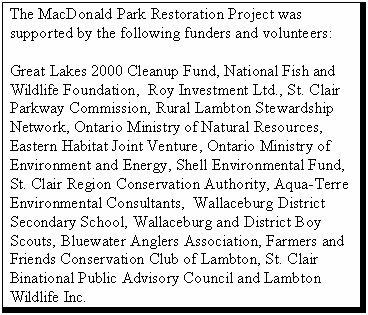 A wetland and prairie restoration project was carried out in a day-use park area along the St. Clair River (Chenal Ecarte) from September 1995 to July 1997. This initiative involved a wide variety of non-governmental groups and government agencies, and numerous funding partners in completing its many components. The work was initiated through the St. Clair River RAP process in helping to restore fish and wildlife habitat in the St. Clair River watershed. This particular project was one of 28 areas originally identified in a earlier report (Survey of Candidate Sites on the St. Clair and Detroit River for Potential Habitat Rehabilitation /Enhancement). Wetland creation, improvement of shoreline riparian areas and establishment of Tallgrass Prairie habitat were the main objectives. The secondary objective was to use this project as a key demonstration area for a variety of aquatic and riparian restoration techniques. MacDonald Park is one of 17 river-side park areas owned and managed by the St. Clair Parkway Commission. Use of this network of parks includes picnicking, camping, boat launching/mooring, swimming, and associated passive recreational activities. This particular site was chosen due to its high potential for a variety of aquatic and upland restoration techniques, the visibility and accessibility along a commonly traveled roadway, and the strong interest of the landowner (the St. Clair Parkway Commission). The project involved the creation of 1 ha (2.5 acres) of wetland, 1 ha (2.5 acres) of Tallgrass Prairie complete with an interpretive trail, improvement of 200 m (219 yds) of shoreline riparian area, as well as interpretive signs and brochures. The original site consisted of maintained grass, used mainly as a picnic area. The wetland component consisted of the excavation of 4,588 m3 (6,000 yd3 ) of material, treatment of the littoral areas with topsoil and stabilization using biodegradable coir mat. A variety of wildlife and fisheries components including spawning mounds, submerged habitat structures, aquatic vegetation plantings, and basking logs, were placed in the newly created wetland area. The bank areas of the wetland were planted with shrubs. Shoreline areas surrounding the site and bordering dredged canal areas were reshaped, gently sloped and stabilized using live willow stakes and brush bundles to establish riparian cover and as a means to reduce erosion. Planting of aquatic vegetation in the nearshore waters adjacent to these areas occurred in a subsequent phase. Experimental biolog floating barriers and bogmat islands were installed to establish in-water structure and provide erosion protection in local shoreline areas. Approximately 200 m (219 yds) of shoreline area were rehabilitated using these techniques. In the 1 ha (2.5 acres) upland site 22,000 Tallgrass Prairie plugs of 23 different forb and grass species were planted. A slightly elevated horseshoe shaped trail system was constructed using excavated material from the wetland area to allow trail users an improved view of the prairie plant species at the height of their growing season. A variety of qualitative and quantitative monitoring has occurred on the site. A fish inventory was undertaken in the newly created wetland in late August 1996, a month following the completion of the wetland component. These results indicated four fish species present in the system: largemouth bass, bluegill, central mudminnow and an esocid species. In 1997, young of year northern pike and largemouth bass were documented in the wetland area. Visual monitoring of both the wetland and prairie components have indicated excellent establishment of plant communities. Informal records are being maintained for amphibians, birds and reptiles that appear at the project site. There are future plans by a local naturalist group to document insect use of the Tallgrass Prairie area with an emphasis on butterflies. Much of the work carried out in this project was well suited to volunteer activities. Over the length of this project, over 75 individuals contributed over 1,300 hours of hands-on work. Key groups in this volunteer effort included Wallaceburg District High School students, local naturalist groups, fish and game organizations, local landowners and Scouts Canada. Although the total area of habitat created was relatively small (2 ha or 5 acres), the benefits of this project lie in its demonstration value, both visually and, as an example of how local community groups can make a meaningful contribution to the environment. It is also an example of how some of the traditional views of waterfront park design or usage can be broadened. These new concepts and techniques can be transferred to many other shoreline park areas along the Great Lakes, particularly where artificial steel or concrete shorelines predominate. The St. Clair Parkway Commission is extremely pleased with the results of this project and are interested in exploring further habitat restoration projects along their other waterfront park properties. This site continues to be of interest to new groups wishing to become involved in activities at this site. For example, a turtle nesting habitat project has been proposed by a Sarnia group and a prescribed burn, a required habitat management technique for Tallgrass Prairie, is proposed for the spring of 1998. Many other areas along the Great Lakes, including the Detroit River, have similar opportunities to explore. Along both sides of the Detroit River, a mosaic of municipal, private, and associated undeveloped waterfront properties may have potential for alternate passive or recreational land uses with varying levels of fish and wildlife habitat possibilities. Organizations with multiple land holdings across a wide area or a riverfront property type which may be commonly found along a particular river stretch would be a key criteria in determining priority sites for demonstration projects. Road endings or road allowances, roadside parks, boat launch areas or drain/creek outlet areas may provide potential for integrating fish and wildlife habitat improvements. All opportunities, both short and long term, should be explored.